Melly M is dedicated to bringing our customers the epitome of class and style with every article of clothing we release. We know how important it is for your comfort and self-esteem to look your best wherever you go, from the beach to the golf course. This is why Melly M strives to create clothing options that are suitable for any occasion, whether you are at work or play. Melly M’s website hosts a section specifically dedicated to high-end golf apparel for ladies, available in all of the brilliant solid colors and bold, unique prints that have made people fall in love with Melly M. Our golf apparel for ladies is created with your comfort in mind. 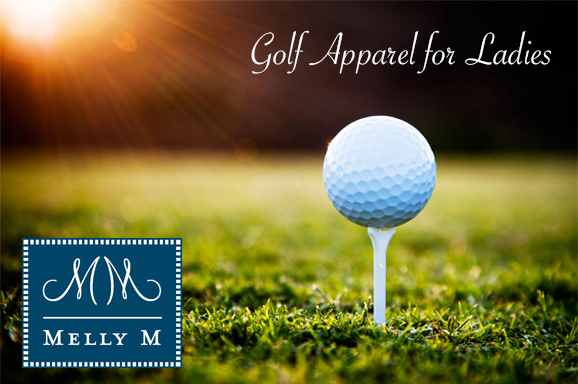 When you shop with Melly M, you know you’re getting premium golf apparel for ladies that is comfy, preppy, and durable. Our quality fabrics are made to last, so your favorite Melly M outfits can be worn again and again. Whether you enjoy wearing skorts, shorts, polos, skirts, or dresses while playing golf, you are sure to find the perfect outfit with Melly M. The dress code that has been implemented by the Ladies Professional Golf Association, or the LPGA, over the years has limited the type of clothing options that are appropriate for the green. This has been a frustrating turn of events for many avid female golf players, who have the desire to look stylish and preppy even while playing their preferred sport. Golf is a sport that is rooted in tradition, and because of this, there are certain rules and regulations that must be followed by its participants, including sporting appropriate attire when on the golf course. It can be hard to remember the exact specifications of what clothing adheres to these specifications when shopping for golf apparel. Melly M makes it easier than ever before to look great on the green while keeping in compliance with the LPGA’s clothing regulations. Our customers repeatedly return to Melly M due to our eye for quality and style in all of the clothing that we create, and our unique and versatile styles will keep you feeling fashionable and comfortable through all 18 holes. If you are interested in purchasing your golf attire from Melly M, please feel free to contact us today.